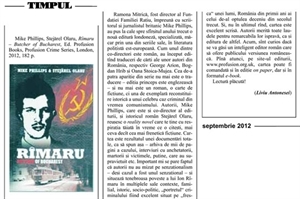 Author and journalist Liviu Antonesei, editor of Romania's leading arts magazine "Timpul", reviews and recommends "Rimaru - Butcher of Bucharest"
Mike Phillips, Stejarel Olaru, Rimaru – Butcher of Bucharest, Ed. Profusion Books, Profusion Crime Series, London, 2012, 182 p.
Towards the end of last year a new London-based publishing house, Profusion, was established by Ramona Mitrica, former director of the Ratiu Foundation, together with British writer and journalist Mike Phillips. Profusion specialises, at least through one of its series, in Eastern European crime writing. Since one of the co-directors is Romanian, they started by publishing translations of books by Romanian authors: George Arion, Bogdan Hrib and Oana Stoica-Mujea. The fourth publication in the series is not a translation – this first edition is in English – and it is not a novel either. Instead, it is a book which is an exemplary reconstruction of a famous criminal case from the communist days. The authors, Mike Phillips, who is also co-director of the publishing house, and the Romanian historian Stejarel Olaru, succeeded in producing a reality novel which you read with bated breath, more so, indeed, than when you read the most frenzied piece of fiction. The book is the result of comprehensive documentation, if I may say so – the case archives, comprised of thousands of pages, includes interviews with the investigators, the witnesses and the few victims who survived, etc. What seems important to me is the fact that the authors did not count on sensationalism – although the case was sensational – and placed the shadowy story of Ion Rimaru in its multiple contexts, family-based, historical, socio-political - the “portrait” of the murderer being masterfully located against the background of a world, Romania during eighth decade of the last century. And, last but not least, the book is excellently written. The authors deserve all praise for their remarkable endeavour, as does the publishing house. Now, I am curious whether there will be any intelligent Romanian editors who might offer a Romanian version to the audience. Until then, the book can be ordered in paperback, and also in the e-book format from the web site of the publishing house.